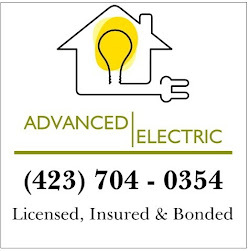 In business since 1987, Advanced Electric is a full service residential electrical contractor in Hamilton County, Tennessee providing your every day electrician needs in Chattanooga and surrounding areas. In business since 1987, we are residential electricians in Chattanooga, Tennessee who provide fast service at reasonable rates. We are locally owned and operated. We are fully insured, bonded and licensed residential electricians in Tennessee. Click here for a list of services we provide. We also provide free estimates on major jobs.